Before we begin I would just like to give you guys out there a little health warning. You see, I am not well, not in the slightest. I have spent the last few days trying to prevent my body extricating all of its vital organs in a decidedly uncomfortable and mildly violent way. So, if during this piece you are handed a vessel which contains something that may look like vomit mixed with human liver and/or kidneys, please DO NOT assume IT IS NOT vomit mixed with human liver and/or kidneys and act appropriately (and preferably don’t spill it on the floor). First up with vessel disposal duties, Editor Kenny, if you wouldn’t mind. But my illness aside, I have brought you all hear for a glorious celebration, a momentous event, you might say. For I (for the second time in 2 weeks) have something amazing to present to you all…. Another Install or not first! I hear you cry? Why yes, this time it is the first PC hardware review in installornot.com history (/me bows to loud and glorious applause, then pukes…… Excuse me a sec while I mop this up………). 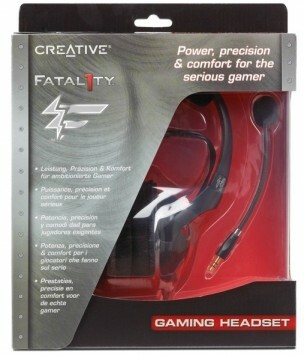 This week we shall be talking about the Creative Fatal1ty HS-800 gaming headset, well, as best a partially deaf guy can. I’ll proceed by talking about the build quality. The headset does feel sturdy but it is made out of plastic. For the money (and the fact it is Jonathan “Fatal1ty” Wendel branded) I would have like to see some faux leather over the head band. I have also noticed that the lateral swivel hinges are a bit stiff and don’t actually have that much movement in them. This can make wearing them with the right hand ear cup behind the ear a little uncomfortable at times, especially when the headset is very new. The headset itself is very well padded. Before I bought this device I did read some reviews (well they were more comments than reviews) on amazon.co.uk that said after a while the headset became uncomfortable to wear, causing pain and a warming of the ear. Now a warming of the ear, when wearing what are effectively very expensive (and very loud) ear muffs in the middle of summer is sort of to be expected. I did experience a little pain from my ears after the first 5 hours or so but after some poking around and a little guestimating I concluded that the headband needed adjustment. I made the adjustment, and I am now able to wear them indefinitely. But this is where people go wrong with headphones and headsets. They don’t think to adjust them so they sit over, instead of, on their ears. The pain you get is caused by the headphones putting pressure on the cartilage that makes up your ear lobe for long periods. Over ear headphones are designed to be just that. They are designed to encapsulate your ears not sit on them like you sit on a lavatory when you have severely upset stomache (speaking of which I’ll brb)………. Sound quality is excellent; just as good as my previous Creative Aurvana DJ headphones. I think a lot of that has to do with my top of the line Creative X-FI sound card but I do also think that it is because Creative makes very good headphones. The HS-800’s do have slightly better low range bass reproduction than my old headphones but I have a feeling that has something to do with them being noise cancelling because the specifications are basically the same. Even though, as I said at the start of this piece, I am slightly deaf, I can still pick up a distinct rumble when explosions occur in games. Treble and mid-range replication seem good, as does overall volume. These headphones are also X-FI CMSS-3D compatible which means they are very good at creating positional surround sound (with the help of a Creative X-FI sound card… oh wait I have one of those). The detachable microphone has also been given very good comments from family and friends whom I speak with while playing using TeamSpeak. They say it is very clear and very good at removing background noise but it does seem to be very bassy and it makes me sound like Barry White and not how I actually sound (which is a bit like a girl). 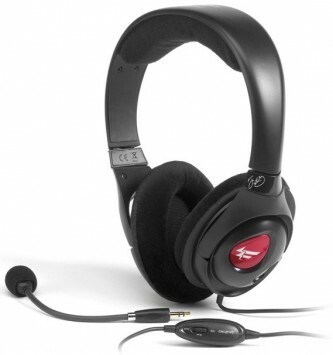 The headset comes with inline controls for volume and microphone cut off. The control module also features a clip so you can clip it on to clothes. I find this handy as it means I can route the audio cable to my pc behind my neck and have easy access to some basic level controls on my collar. The audio cable itself is nothing fantastic but it’s a straight cable and at 2 meters long could most definitely do with being coiled (and probably shorter).